Café Scheherazade by Therese Radic. A play based on the novel by Arnold Zable. Director: Bagryana Popov. fortyfivedownstairs (Vic). Premiere Season - 8 Mar – 3 Apr, 2011l. Return season Aug 20 to Sep 11. For almost fifty years Café Scheherazade in Acland Street, St Kilda was the meeting hub for displaced Jewish migrants who had fled the Hitler and Stalin regimes in Europe. Listening to their stories of survival, persecution, tragedy and hope, writer Arnold Zable crafted a novel (2001) which is the basis of a new play by Therese Radic now in the throes of its premiere season. 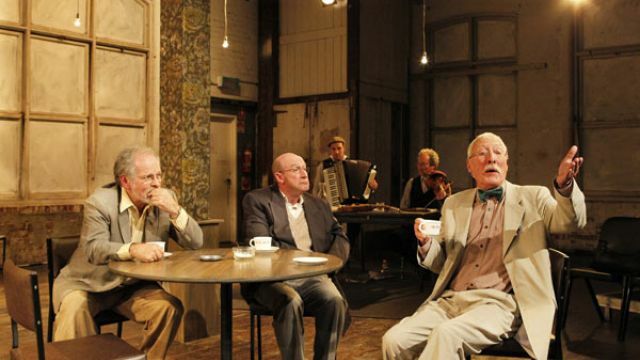 Cafe Scheherazade is a play about memory. Its relentless storytelling demands the audience’s patience, and is suspended by the gentle presence of writer Martin (Jacob Allen). The stories are painful to tell, and difficult to hear, yet their telling, coupled with companionship and hearty homeland food nourish those in the cafe. Performances are strong, particularly Marta Kaczmarek (Masha) and Jim Daly (Avram) for whom audience affection and empathy peaks towards the close. Music is pivotal, sometimes rousing, then reminiscing, and always complimentary and skillfully rendered. Justin Marshall (piano accordion) and Ernie Gruner (violin) strike just the right note, utilisingtheir instruments in song, and creating aural illusions which include a dripping tap and the thudding of train on tracks. Not-for-profit space, fortyfivedownstairs, provides the intimacy necessary to stage this material, an encounter that begins with a 52 stair descent from street level, and ends with apple strudel and black-forest cake. Australia’s “innocence” in respect to political persecution is underlined, yet our nation’s relative inexperience is cause for hope. One cannot help but draw comparisons between the shabby hospitality currently being offered to asylum seekers with the welcoming balm once found at Café Scheherazade. 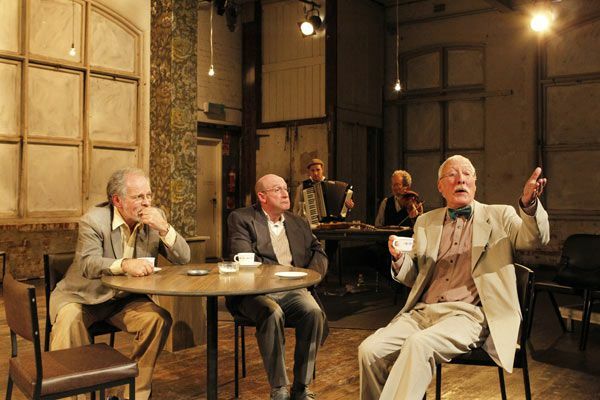 Café Scheherazade is warmly commended as a compelling ninety minutes of theatre which may prompt a dose of self-reflection. To keep up with the latest news and reviews, visit Stage Whispers on Facebook and click like, or follow us on Twitter.